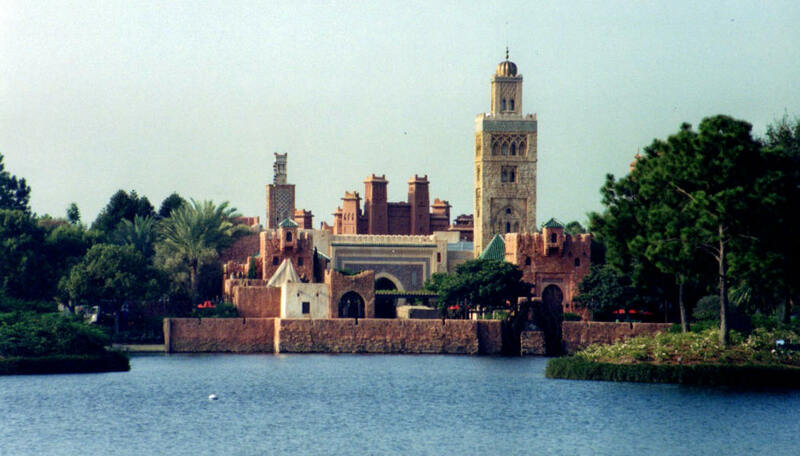 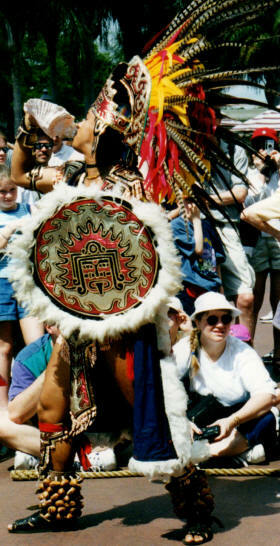 Epcot's World Showcase is an ongoing World’s Fair encircling a picturesque 40-acre lagoon. 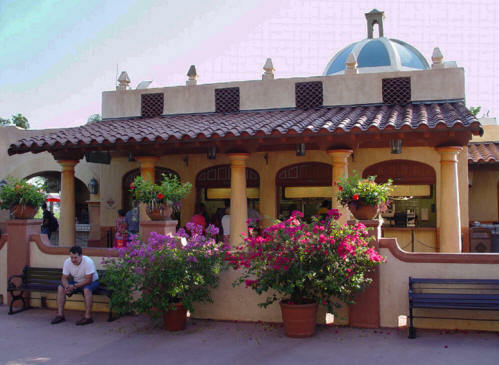 The cuisine, culture, history, and architecture of almost a dozen countries are permanently displayed in individual national pavilions spaced along a 1.2-mile promenade. 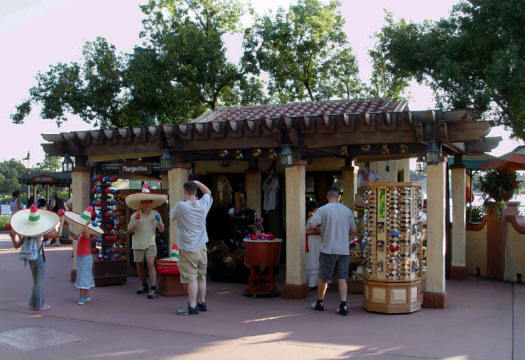 Pavilions replicate familiar landmarks and present representative street scenes from the host countries. 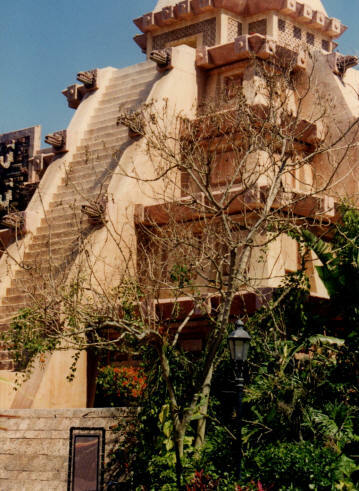 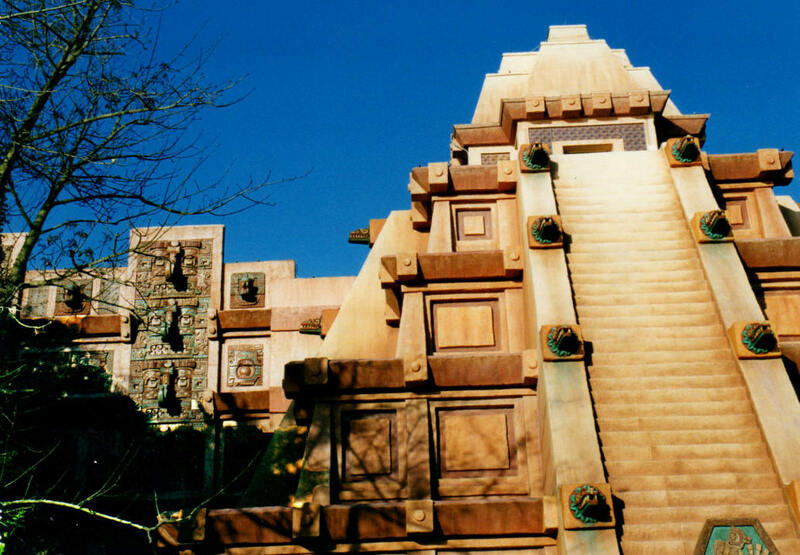 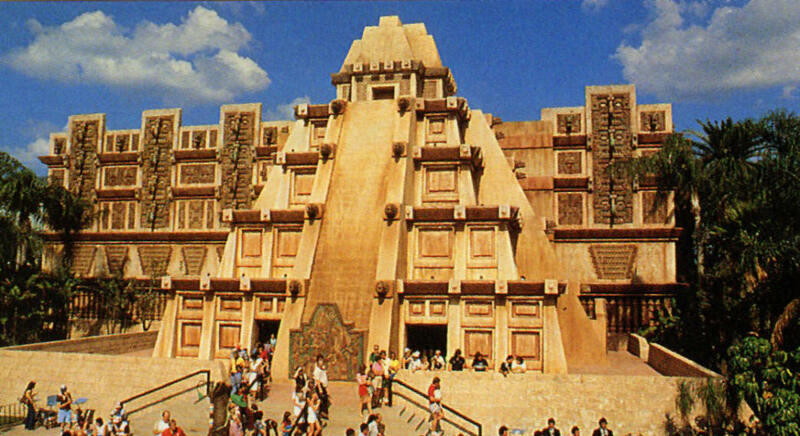 The Mexico Pavilion resembles a Mayan pyramid with steps leading to entrance doors. 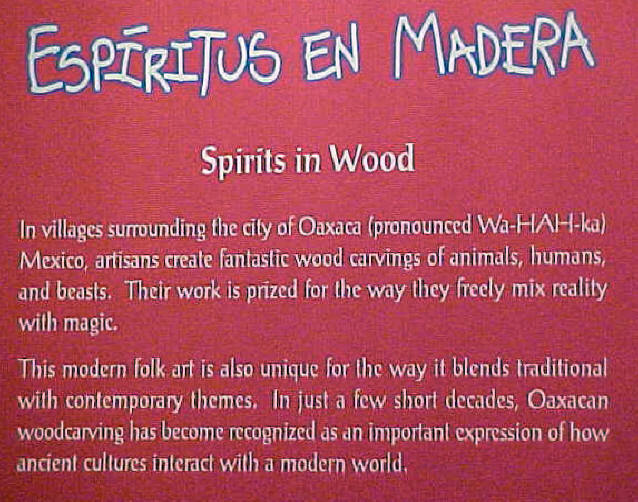 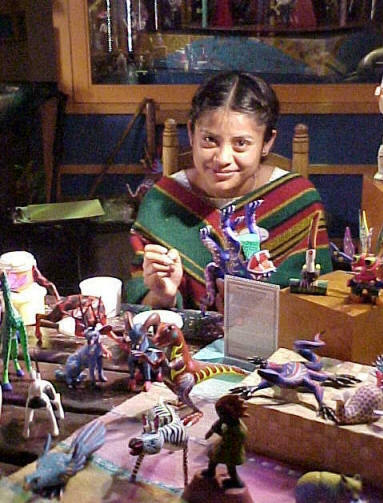 Visitors enter through a gallery display of Mexican artwork. 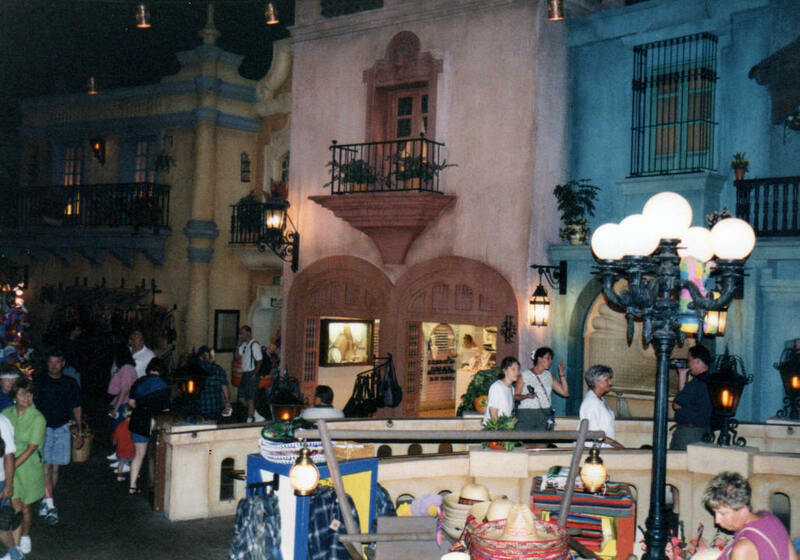 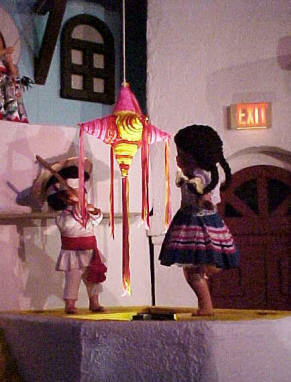 The central indoor area of the pavilion is themed as an outdoor twilight-lit Mexican village and marketplace. 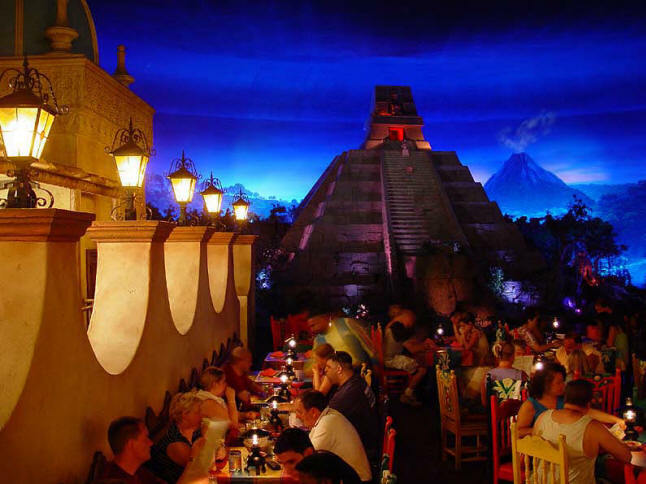 At the edge of the plaza, a restaurant, San Ángel Inn Restaurant, overlooks an indoor lagoon with a themed backdrop of another pyramid and smoking volcanoes in the distance with themed lighting and smoke effects. 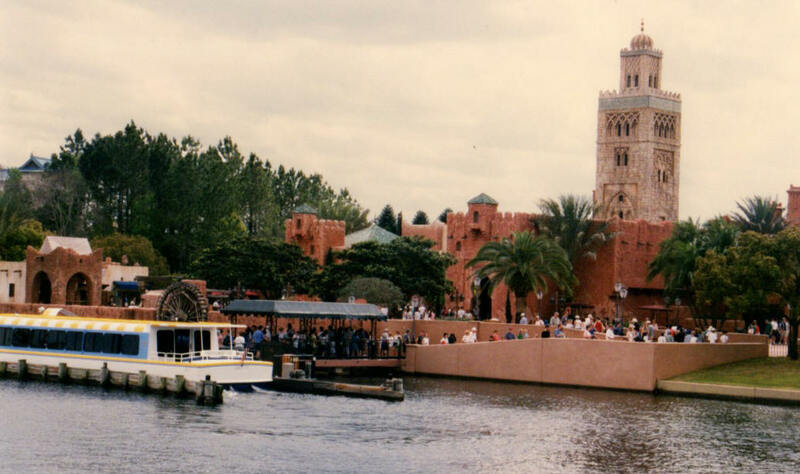 To the side of the plaza, a boarding area leads to a boat ride. 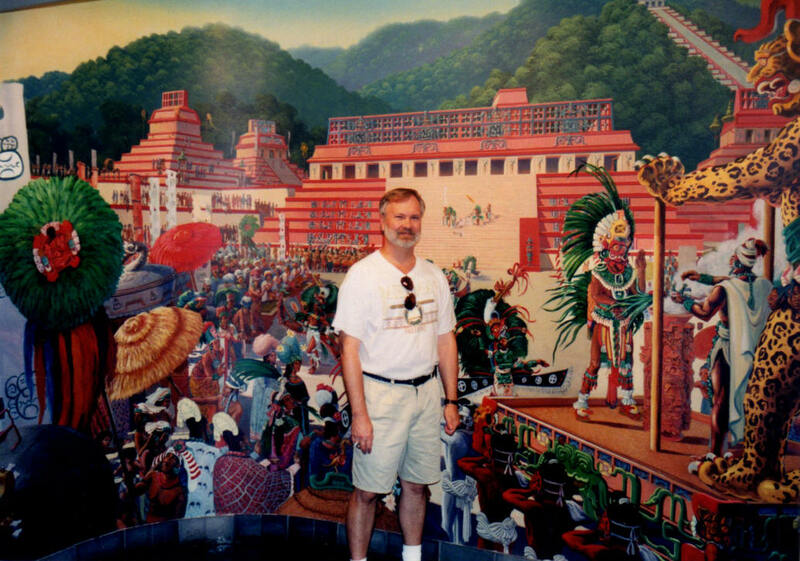 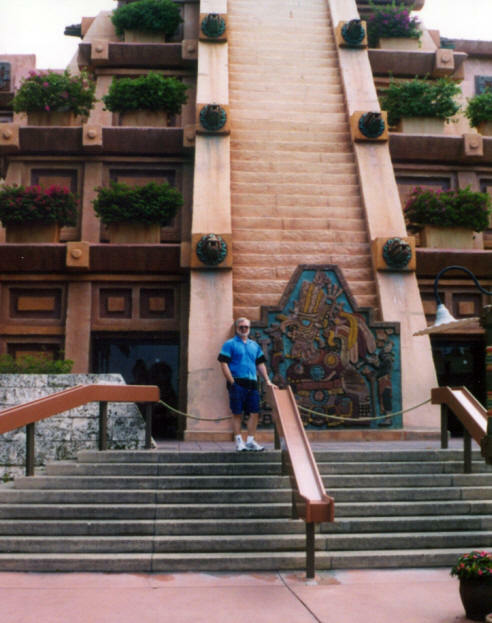 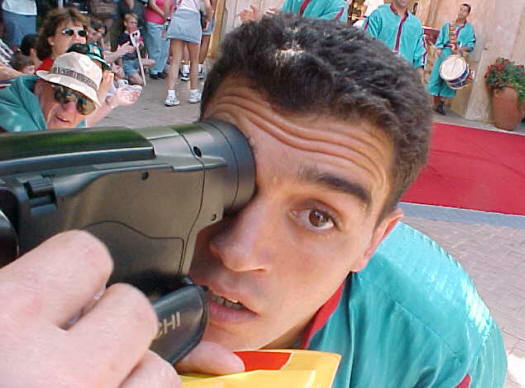 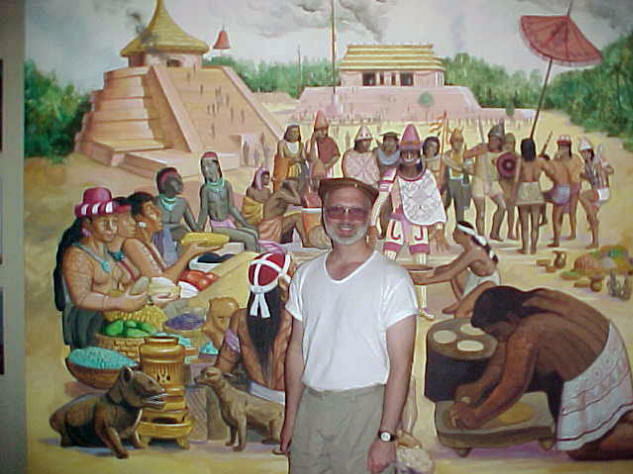 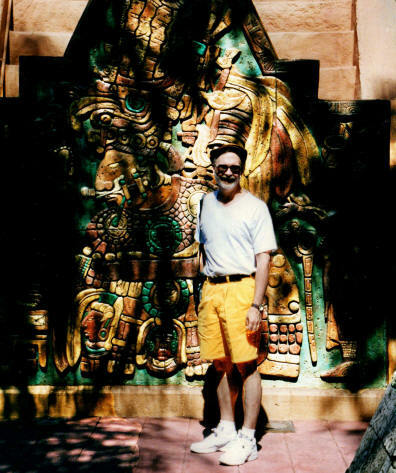 In 1997, Curtis poses iin front of a mural inside the pyramid. 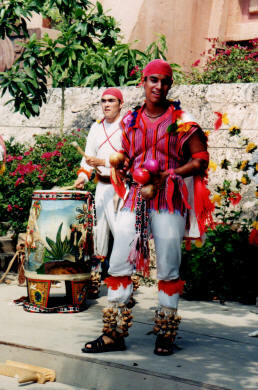 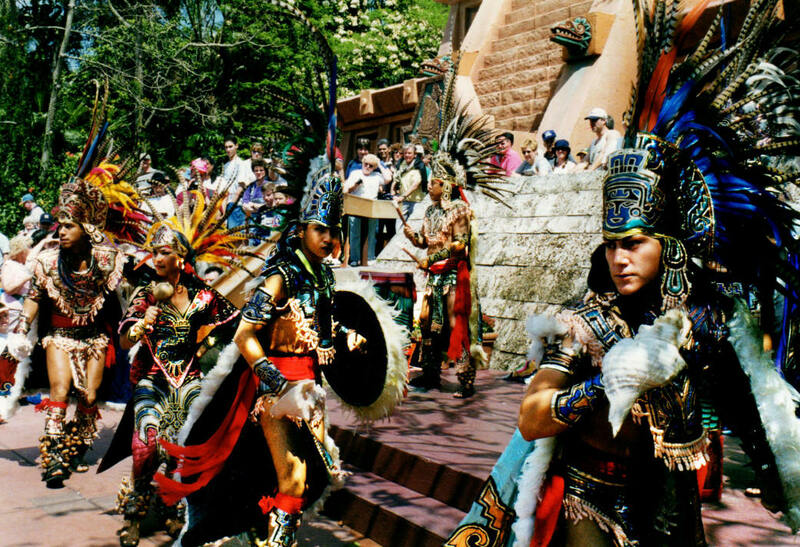 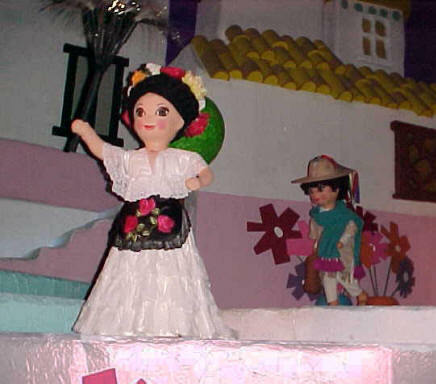 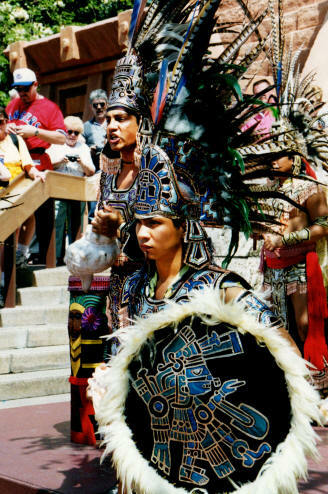 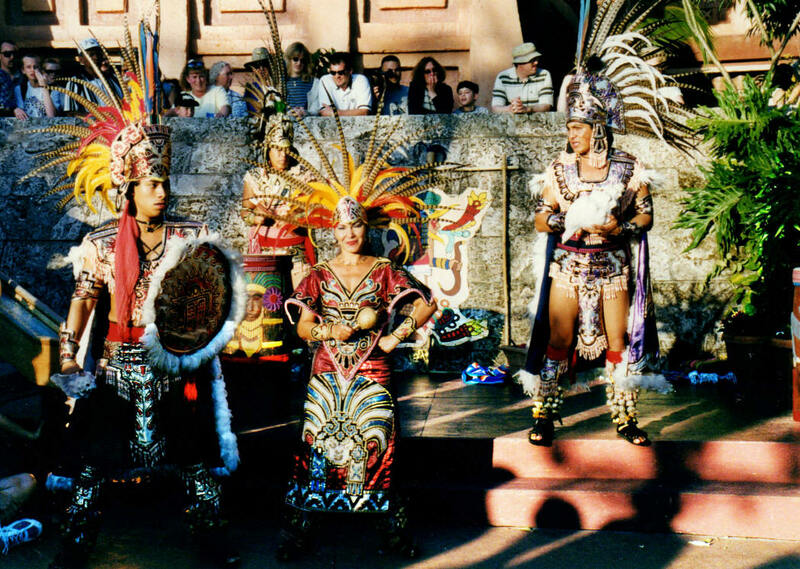 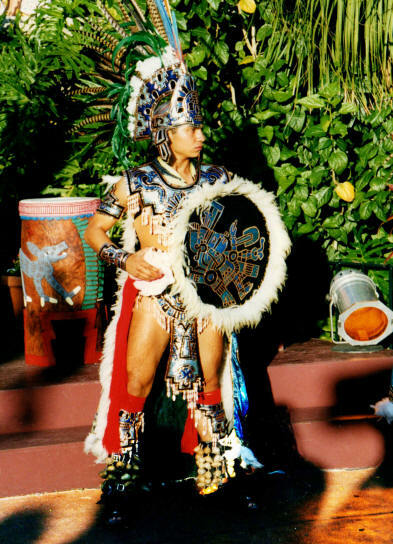 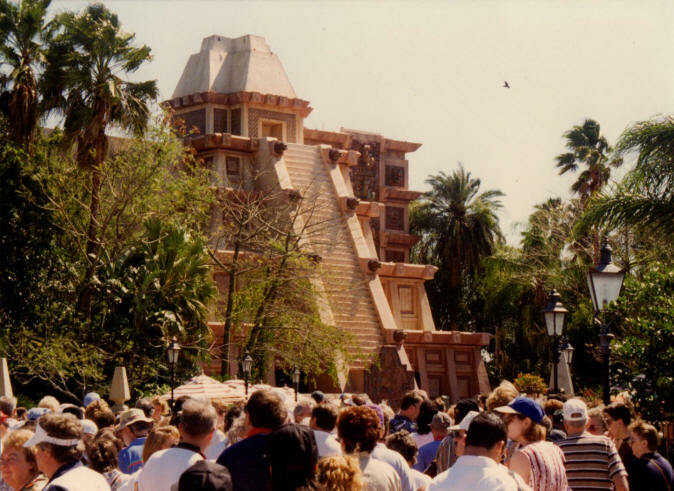 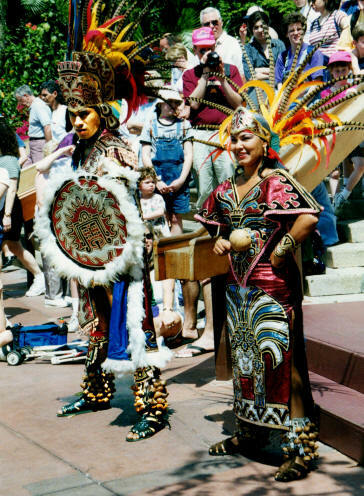 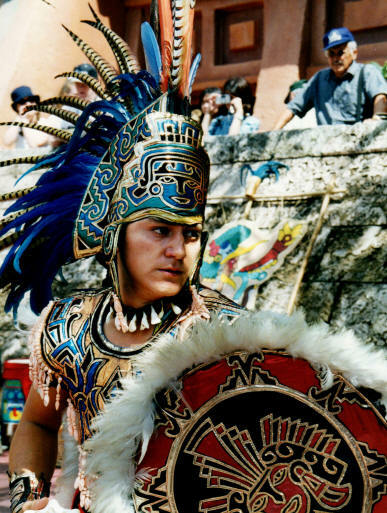 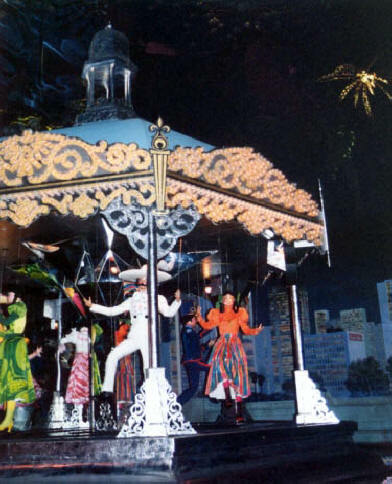 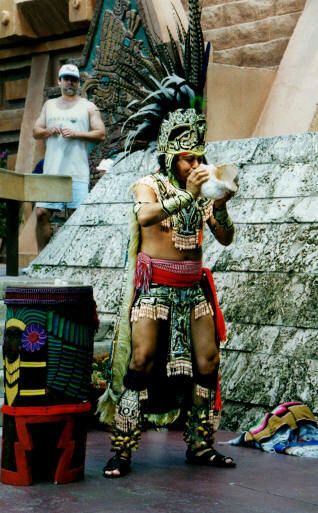 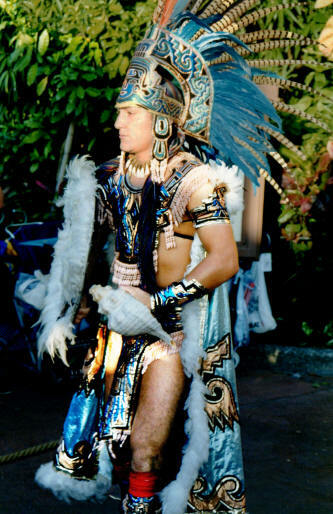 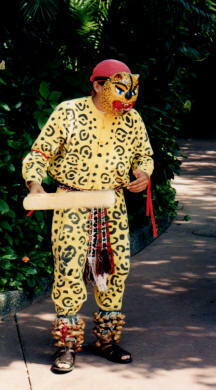 From 1982 to 2007, The River of Time carried passengers on a slow boat ride through various scenes from Mexico's history. 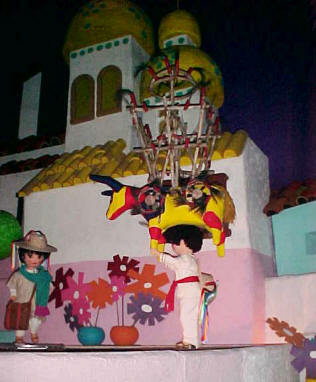 The scenes were filled with doll-sized Audio-Animatronic figures clad in authentic folk clothing, singing, dancing and playing music. 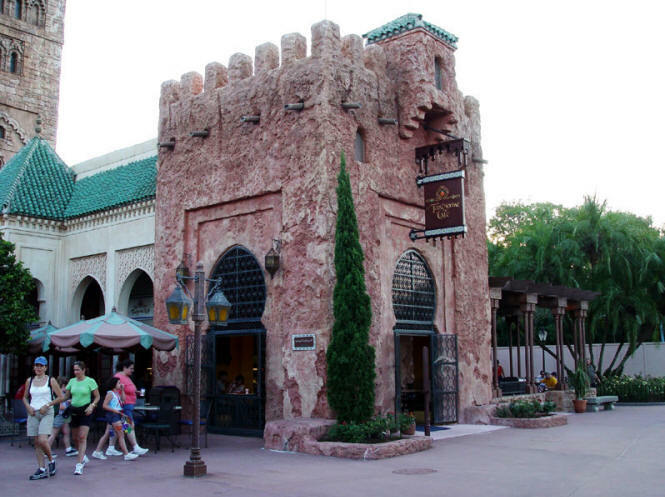 The cobblestone town square at the Norway Pavilion was an architectural showcase in the styles of such Norwegian towns as Bergen Oslo and Setesdal. 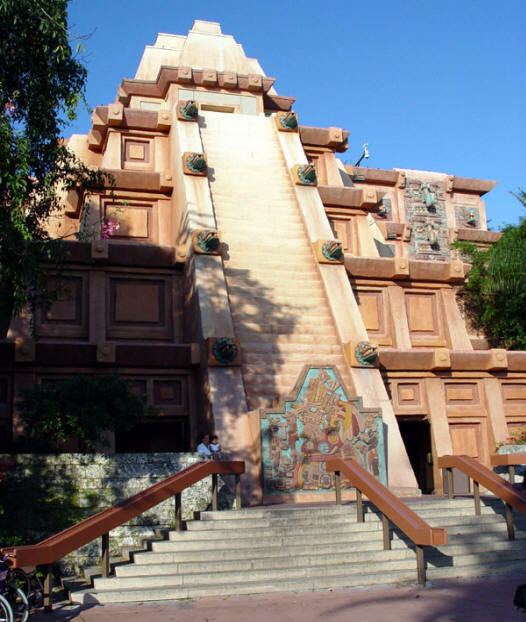 There's a Norwegian castle fashioned after Akershus, a 14th Century fortress still standing in Oslo's harbor. 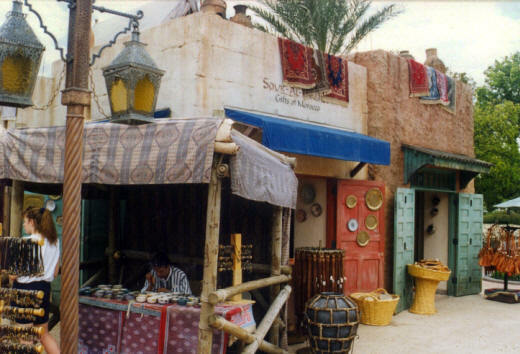 Shops in the castle stock authentic Norwegian handicrafts and folk items: hand-knit woolens, wood carvings, as well as glass and metal artworks. 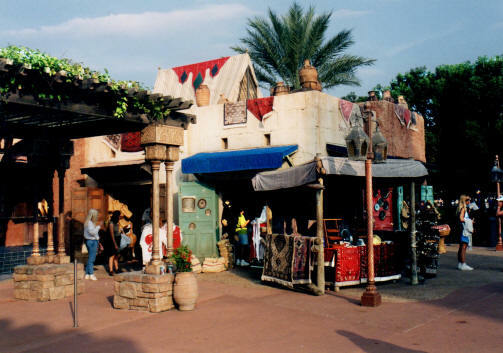 The Morocco Pavilion was filled with activity, shopping and eating. 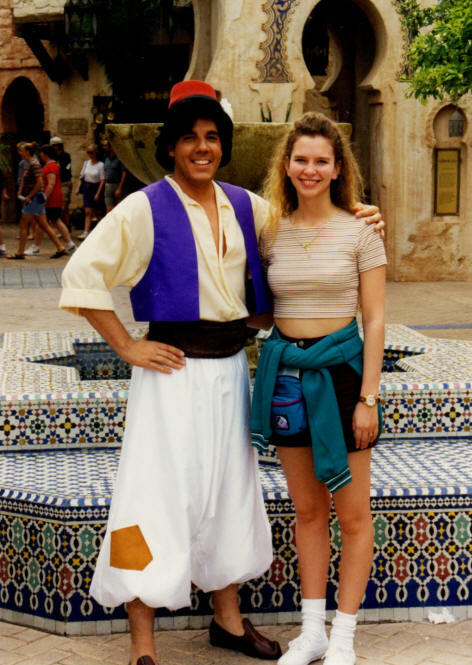 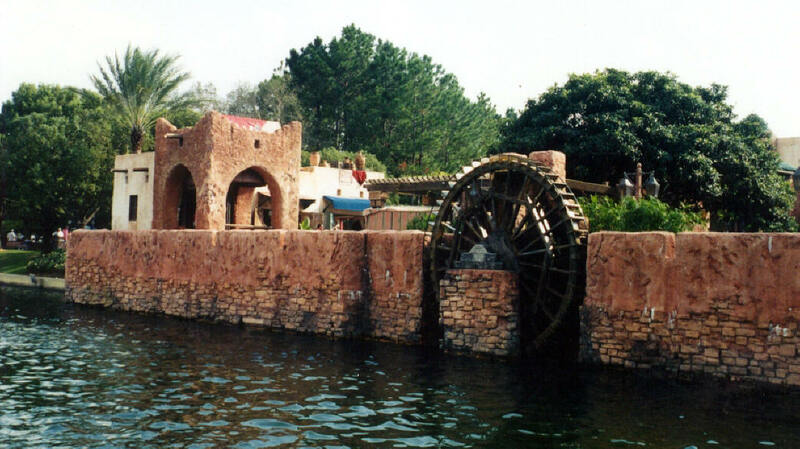 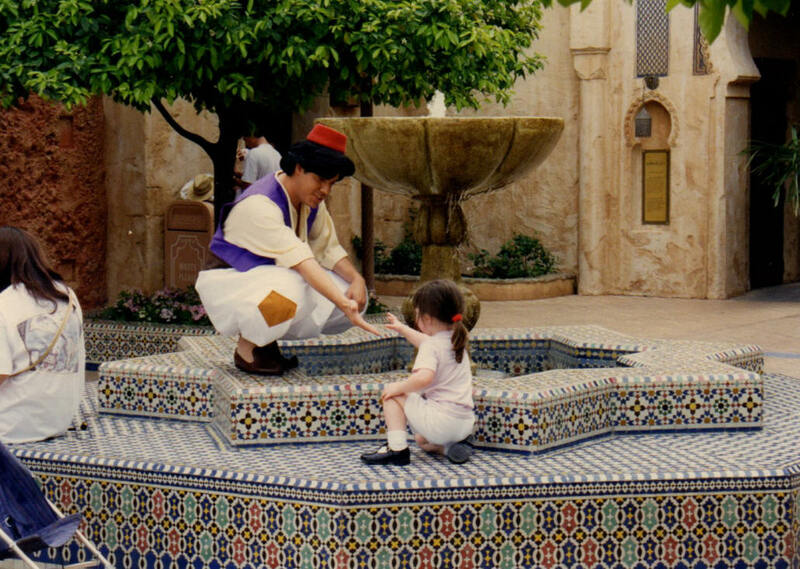 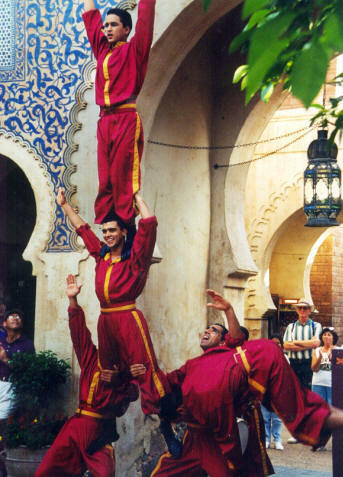 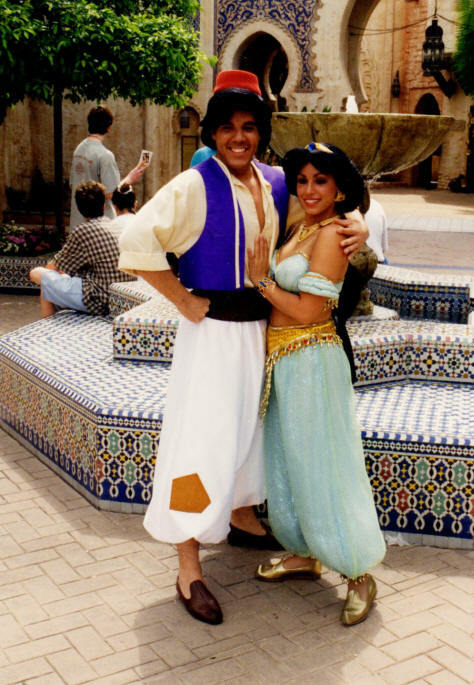 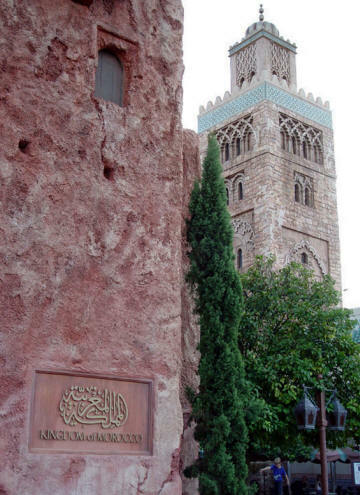 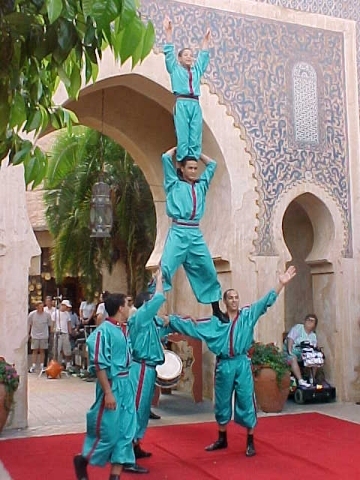 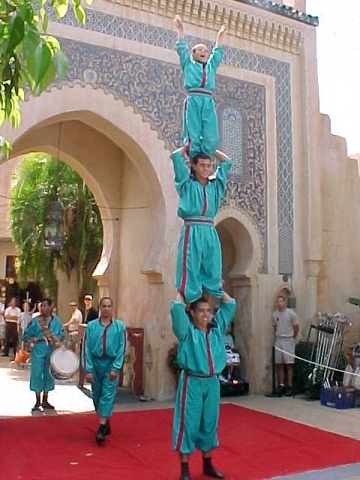 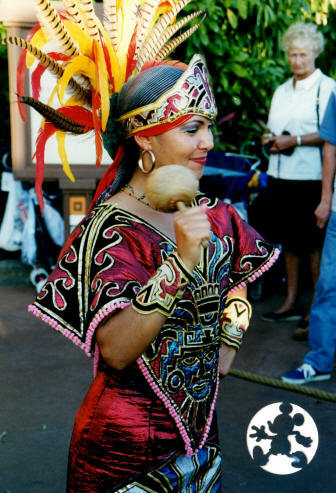 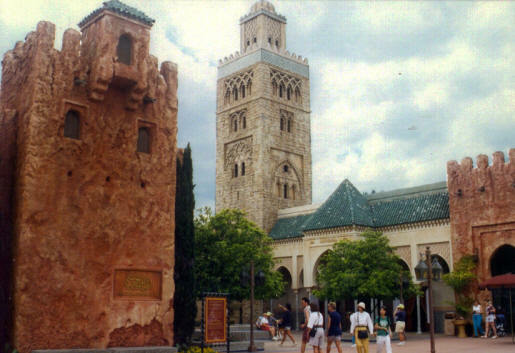 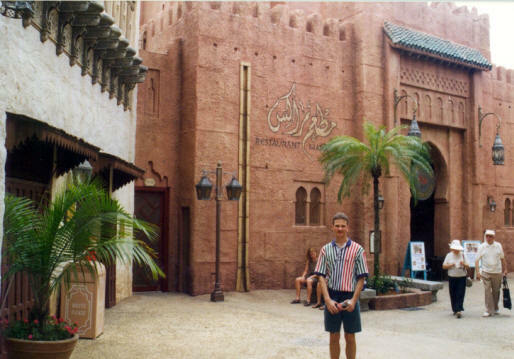 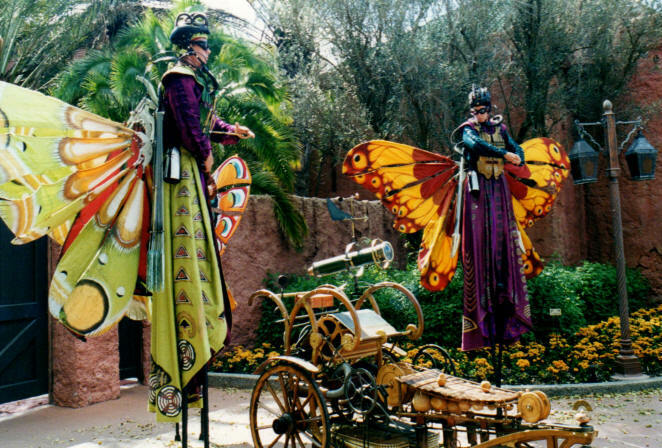 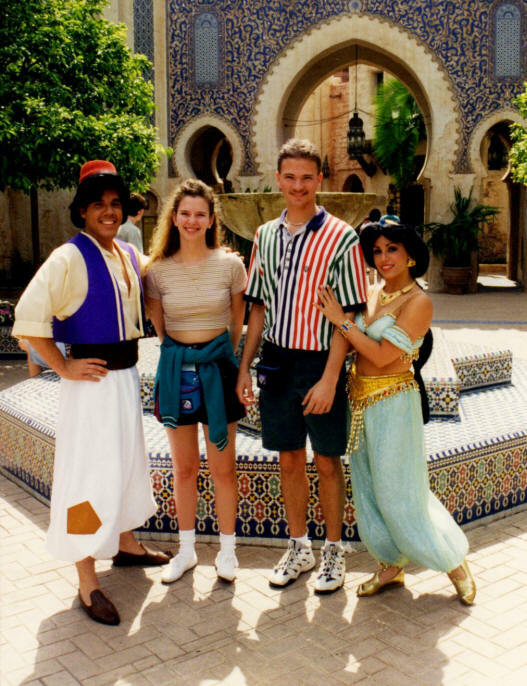 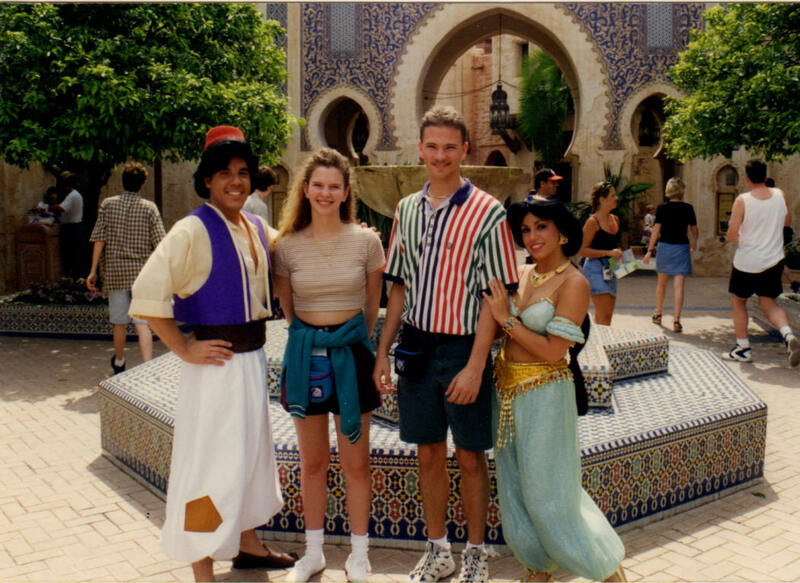 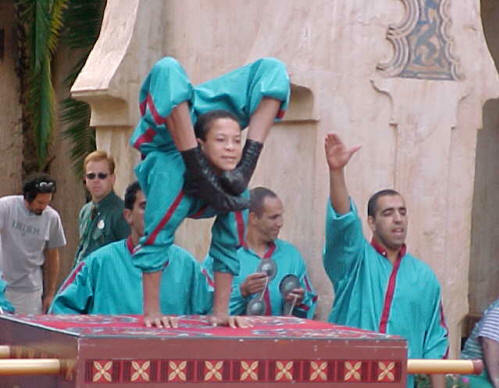 Morocco was favorite pavilion when we first visited Disney World in 1996 - both culturally and with the beautiful architecture . 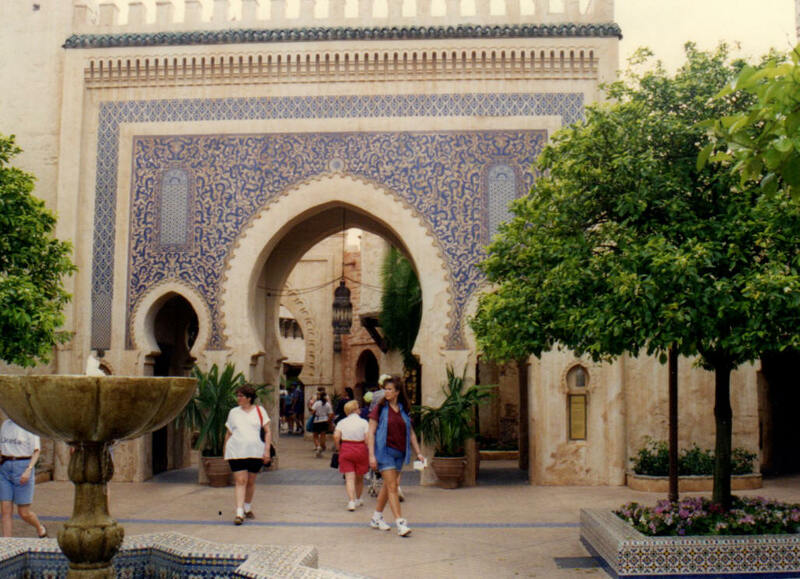 and swirling blue patterns of the Bab Boujouloud Gate, a replica of the one that stands in the city of Fez. 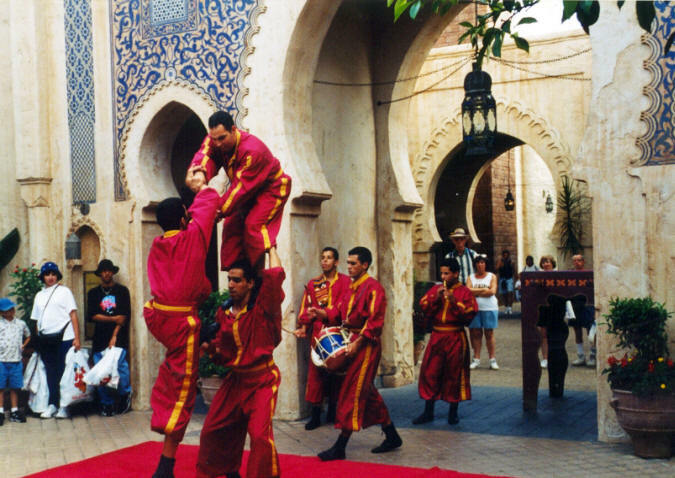 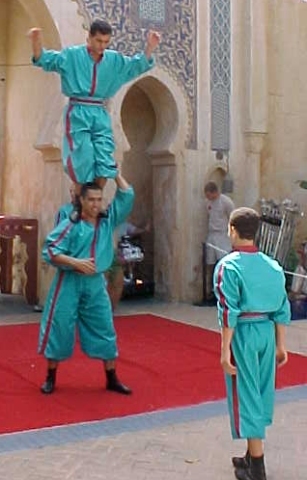 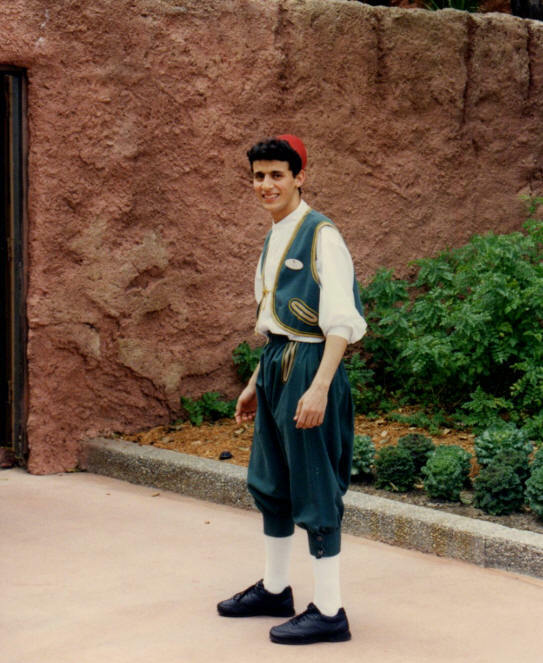 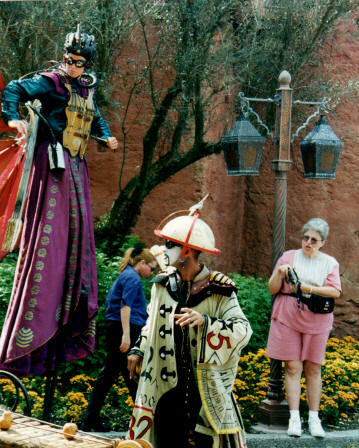 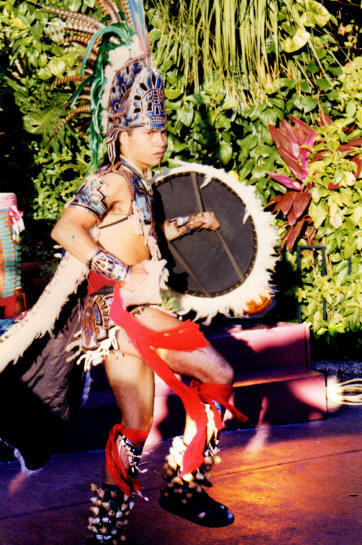 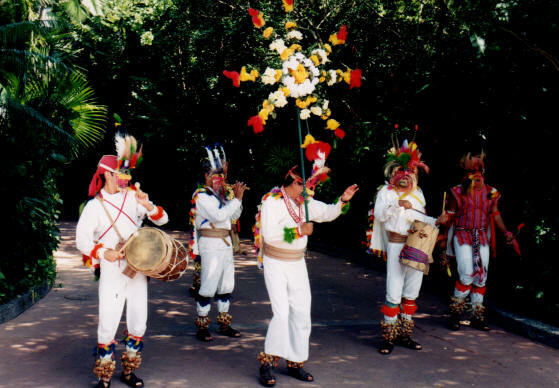 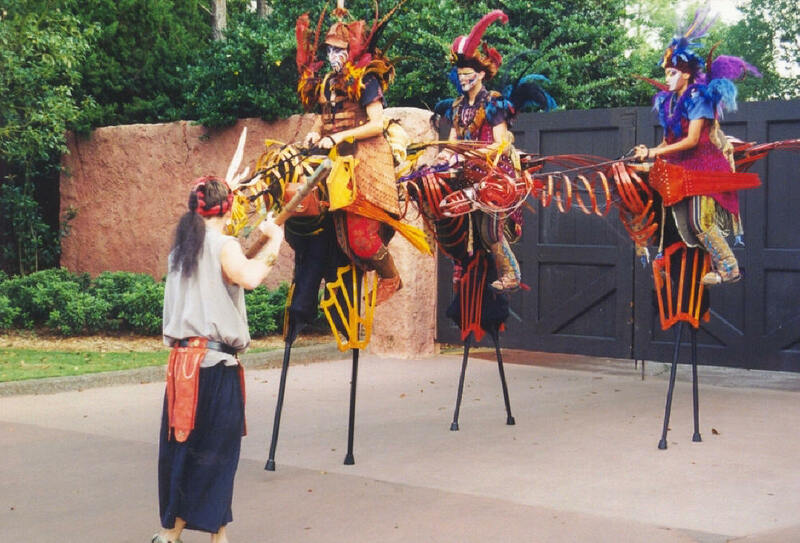 When we went back to Walt Disney World in 2000, the first thing we looked for was "Cirikli"
Unfortunately, the were no longer performing at Epcot and had been replaced by a group called "The Aviators"